It is often said that necessity is the mother of invention. While that may be true in wider society, in the offshore energy sector regulation is seen as the predominant driver of innovation. The oil and gas industry is heavily supported by federal governments that are responsible to a wider society and, as such, it has long been closely regulated. In turn, the industry’s elite companies have dedicated significant resources to research and development to improve occupational health and safety standards, giving rise to concepts such as process safety and asset integrity across a multitude of global industries. By any measure, drilling for oil and gas offshore is one of the most dangerous of professions, one where the risks, while often very well controlled, are unavoidable. Workers often average 12-hour days as they deal with highly combustible materials on work platforms situated hundreds of miles offshore and with cranes constantly swinging heavy equipment overhead. It can be a lonely experience, sometimes for seven to 14 days at a time. It is perhaps because of those difficult conditions that the offshore industry measures its safety success or failure by the number of injuries, hydrocarbon releases and major incidents. While accidents on oil rigs are rare, they can yield catastrophic consequences on human life, the environment and the economy. Piper Alpha, one of the first disasters - and the worst in terms of human loss - was completely destroyed in an explosion in 1988, killing 167 men, causing the loss of approximately 10% of the UK’s oil and gas production and causing $3.4 billion of insured losses. In a much more recent incident, the Deepwater Horizon oil spill in 2010 claimed 11 lives, caused the largest oil spill in the history of the Gulf of Mexico and, at last count, a record $4.5 billion in fines for the operator. Both accidents continue to have a global impact on the industry, changing the way we look at the key risks associated with working offshore and giving rise to new trends in occupational health and safety. The best way to capture the risks associated with working on offshore platforms is to visualise them as what they really are: floating cities where extremely complex deep-sea drilling operations are designed to produce highly hazardous chemicals 24-hours a day. On the one hand, you have a high-risk process operating at extreme temperatures and pressures, potentially exposing workers to health hazards such as hydrogen sulphide, crystalline silica, naturally occurring radioactive materials and high levels of noise. This makes a platform a very challenging work environment for occupational health and safety professionals, an environment in which both the extraction of energy sources and processes associated with facilities management can present risks. It is also not uncommon for many of those activities to be outsourced to third parties, potentially escalating the level of risk, depending on the competence of those workers and how well the rig operator communicates the roles, responsibilities and goals of the safety system. Due to the nature of occupational and financial risks, the oil and gas industry has long been heavily regulated and governed by a variety of legislative frameworks and international standards. Traditionally, prescriptive legislation – with its associated list of requirements – has been imposed on operators to ensure that occupational health and safety best practice is embedded across the company’s entire operation, both onshore and offshore. In the USA, for example, the key regulator is the Occupational Safety and Health Administration (OSHA), while industry bodies such as the American Petroleum Institute (API) and the American Industrial Hygiene Association (AIHA) play major roles in setting standards for the industry. Insurers and, increasingly, active investors, also impose demands on the rig operator. This complex overlap of often competing demands from external stakeholders within a prescriptive regulatory environment has given rise to a tick-box culture, in which operators, further pressured by production targets, are left with little time to comply with the letter of the law or safe practice guidelines. A culture of complacency and a lack of operational transparency can creep in, which prioritise ‘checking the box’ to comply with the law and limit legal liability, rather than following a systematic approach to identify health and safety risks and create solutions to manage them. Some regions have resisted a transition to goal-based regulatory regimes, because prescriptive regimes are simpler to implement, monitor, verify and prove compliance in the courtroom. With operators delving into more hostile or lesser-known environments to search for the remaining stores of oil and gas, however, prescriptive regimes are being found to be less adaptable to new technologies and the changing levels of operational risk. Moreover, they can also stifle the innovation required to adapt. UK regulators used to impose a similar prescriptive format, but Piper Alpha precipitated a migration away from that type of regulatory framework to a more risk-based approach, in which organisations were asked to set and meet key safety goals, adherence to which is then monitored by the regulator. The transition to a goal-based approach places major responsibility on the operator or licensee to undertake a comprehensive risk assessment and ensure that risks are reduced to as low as reasonably practicable (ALARP). By holding organisations accountable while giving them more freedom to self-regulate and create practical solutions based on their experience, the goal-based regulatory regime has created a more cooperative environment, in which the regulator assumes a supervisory role rather than a policing one. The oil and gas industry trade associations created a programme in 1997 called Step Change in Safety, which had the aim of reducing injury rates by 50%. To compliment these efforts and ensure continuous improvement of the overall safety culture, the UK’s Health and Safety Executive (HSE) set a three-year strategy for companies in the sector, complimented by programmes and key performance indicators (KPIs). 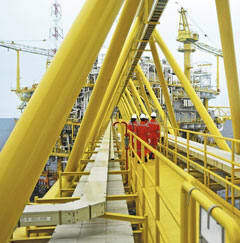 Between 2000 and 2004, the HSE first tackled the issue of reducing hydrocarbon releases, a key measure of safety performance, by conducting extensive inspections and visits to offshore facilities. This led to the decision to dedicate extensive resources to the study of asset integrity management (AIM). The subsequent recommendations were embedded into legislative frameworks to help stem the major decline in the condition of older installations. To help promote operational safety, regulators got involved directly with the owners and operators of drilling rigs by providing guidance and hands-on support. This resulted in a significant reduction in major accidents. In 2010, with the industry's spotlight trained on the Gulf of Mexico, the HSE embarked on another programme: to review the ageing and life-extension challenges that compromised the ability of older facilities to operate safely on a continual basis. In 2013, the HSE released a report that highlighted more improvement opportunities for regulators and operators alike, helping to ensure that this close partnership would continue to yield positive results and serve as an example for all industries. Today, we see this goal-based approach being followed in other countries. Regulators are continuing to develop policies and standards while moving away from micromanaging each asset’s operational environment, in favour of taking a supervisory, supportive role that provides guidance and performance monitoring. The trend has placed a stronger emphasis on implementing occupational health and safety management systems, developing process safety and ensuring asset integrity. While not as visible as asset systems, management systems play a key role in ensuring that occupational health and safety is maintained through a risk-based approach. They emphasise the development of comprehensive risk assessments and standard operating procedures, which help to ensure the safe execution of high-risk activities. In response to the Deepwater Horizon incident, the Canadian National Energy Board commissioned the Arctic Review. This was a comparative analysis of several major industrial accidents, to study the role that management systems played in major accidents and to determine whether there were any related trends or relevant lessons for incident prevention. The assessment found that while most organisations involved in accidents had developed management systems, those systems were often not effectively implemented or reviewed on a regular basis to ensure their continued adequacy and effectiveness. Most importantly, meaningful hazard identification and risk assessment processes were often not followed. What this revealed was that there weren’t any new types of accidents occurring, just old causes of accidents repeating themselves. The report placed great importance on the role of corporate leadership in the prevention of major accidents. Managing process safety effectively, ensuring a competent workforce at all levels of the organisation, providing timely and accurate information for strategic decision-making, and promoting an understanding of the consequences of change in the operational environment are key leadership attributes that raise performance and ensure that occupational health and safety is given equal priority to any production goals. Another trend highlighted by the report is the importance of integrating information related to process safety and corporate culture when reporting health and safety performance. This encourages the industry's transition away from a focus on personal injury data as a safety measurement tool. Deepwater Horizon is prime illustration of how management can be led astray: in the days before the accident, the rig’s low personal injury data gave a false indication of the asset’s process safety performance and the overall health of the safety culture. Internationally recognised management systems are comprised of programmes that are designed to achieve a reduction of risk to ALARP for the public, workers, contractors, assets, production and the environment. To get a more complete picture of overall safety performance, regulators and organisations alike are being encouraged to look beyond ‘lagging’ indicators such as lost time injury rates, to consider indicators for both high frequency, low consequence events such as worker injuries, and low frequency, high consequence incidents such blowouts and fatalities. This ensures that active and latent threats to process safety, such as asset integrity, human factors, organisational deficiencies and safety culture are identified and managed by the operator to maintain the greatest margin of safety. The structural integrity of offshore installations and their supporting assets underpins the safety of all offshore workers and the surrounding environment. In recent years, there has been a greater effort from regulators and stakeholders to embed best practice into the operation and maintenance of offshore facilities. Operating an asset in an extremely corrosive environment, where it is exposed to high temperatures and pressures and adverse weather conditions, requires a strict system of inspection, analysis verification and repair, if the level of risk is to be controlled to ALARP. The creation of the Safety Case Regulation and the Design and Construction Regulation ensured that, in the UK, asset integrity strategies became part of the legislative framework that governs the operation of offshore installations. KP3 found that the offshore industry did not have reliable KPIs in place to focus its attention on asset integrity measurement, while simultaneously providing reasonable levels of assurance that strategies to manage major hazards would stay effective as conditions changed. This discovery initiated a global effort to embed asset-management strategies into existing management systems and planned maintenance routines. Maintaining hardware to be safe, reliable and efficient is not only essential to manage the risk of major accident hazards faced by the industry, it also plays a vital part in creating a physical environment that people can be proud to work in, which is a key feature of an incident-free workplace. In the past 20 years, there have been substantial improvements in the quality of assets and the management systems that support and promote quality, safety, energy efficiency and the environment. Assets are now safer by design. It is generally accepted by modern safety experts that at least 80-90% of major accidents across all asset-intensive industries are caused by human factors, or human error. Most safety practitioners now accept that the next incremental advance in workplace safety will come from a better understanding of the influence that workers have on the operational efficiency of an asset. Managing human factors aboard offshore installations is as crucial to the safe operation of an asset as ensuring the right infrastructure and management systems are in place. A positive safety culture is essential, particularly in an environment where workers face long demanding shifts, difficult working conditions and a very high potential for fatigue. With the ever increasing global demand for energy creating a huge employment market, the offshore sector must manage a constant influx of new, sometimes novice, employees. Most offshore installations employ very comprehensive training and skills-evaluation programmes to ensure all workers, including contractors, are competent to perform their assigned tasks and are very familiar with the safe working procedures relevant to their activities. Most installations employ a zero-tolerance policy for non-compliance and workers can be dismissed for the breach of a safety standard. Understanding the influence of the human element is complex and we are only just beginning to recognise the influence of the workforce on the efficient, and therefore safe, operation of offshore assets. Nonetheless, there are clear trends emerging. For one, emphasis is shifting away from a reliance on the deployment of company ‘safety police’ in favour of employee engagement tools such as incentives, which give workers a stake in the process. There is also much greater recognition of the importance of clearly defined roles and responsibilities with regard to safe practice. With global labour demands giving rise to the number of sub contractors working at any given facility, it is vital that all parties understand their safety-related roles and responsibilities, and share common ways to measure success. Most of the easily reached conventional energy stores have now been depleted. Some of the harsher environments the industry must now enter will require new technology, systems and practices to extract new stores of energy. Understanding how those new conditions will impact on safe operations will be the key to maintaining a productive work environment.